I feel very blessed to have had a wonderful pregnancy, birth, and start to life together as a new family of three–and have to thank Health Foundations for providing the support to make it happen. 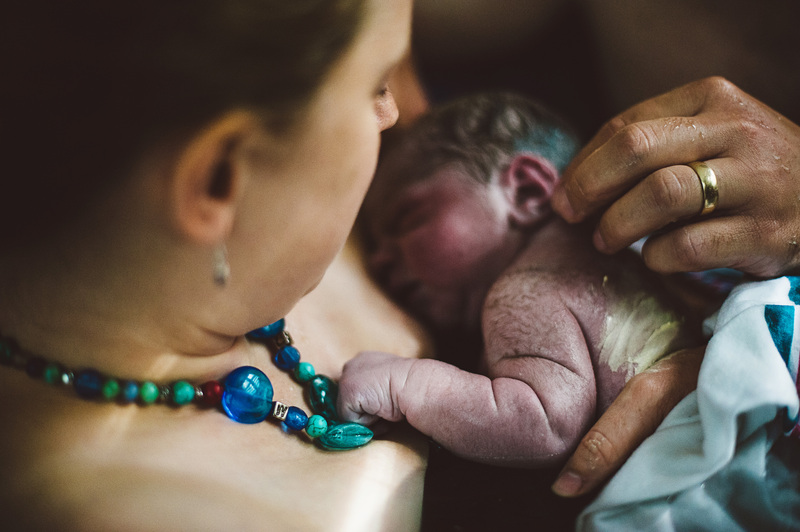 When I became pregnant, I thought how and where I was going to give birth would be a no-brainer–I assumed I would do what all of my friends did: a hospital birth, with my OB, and definitely an epidural (you’d be crazy not to, right?!). My first trimester was going so smoothly that I became a bit paranoid that I wasn’t really pregnant. So Fran and I kept our pregnancy a secret from everyone until we made it to the second trimester. During that first trimester it felt like a mini honeymoon with Fran because we found ourselves staying in to avoid the questions around why I wasn’t drinking, etc. One night we searched Netflix for anything “baby” and came across “The Business of Being Born.” This documentary opened our eyes to a whole new concept around birth, and spoke to me in a way that really excited me. Fran and I had spent the prior 2.5 years completely changing our approach to health. Essentially we committed to putting health first, starting with our approach to fitness (we joined a Crossfit gym) and then diet (we did a lot of research around the pitfalls of the “standard American diet” and starting to cut out grains and sugars that were inflaming our system and keeping our bodies from burning fat for energy). 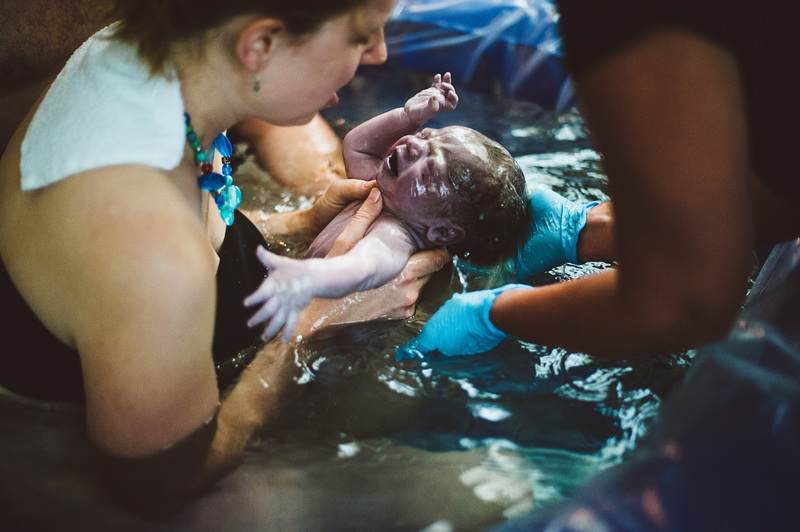 We had such a positive experience with this “alternative” approach to health, that I found myself very receptive to an “alternative” approach to childbirth. I have never had a need to go to a hospital before in my life, so I really started to wonder why I should need to be in a hospital now, with all these potential intervention measures, when I was the healthiest I’d ever been in my life and knew that women have been delivering babies naturally for thousands of years? After watching that documentary and a few others, we started doing a lot of reading and research, we toured birth centers and hospitals, and spoke to midwives and my OB about our options. After a lot of debate and consideration, we followed our gut instinct and decided to transfer to Health Foundations when I was 20 weeks in to my pregnancy. The remaining fears I had around being out of the hospital quickly went away as I had my prenatal appointments with the midwives and started taking the child birth education classes. 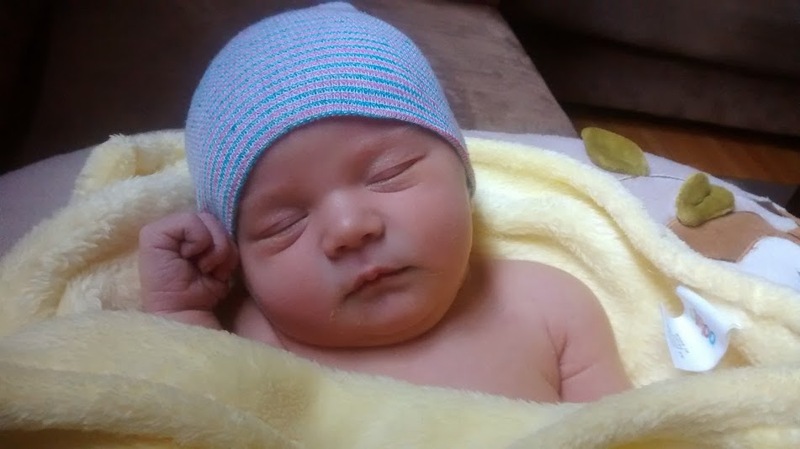 Okay– now on to my birth story! When I was 34 weeks along, I got this strong feeling that my baby was going to come early. I don’t know what it was, but I was convinced. So imagine my disappointed when my “due date” came and went, and no sign of baby! 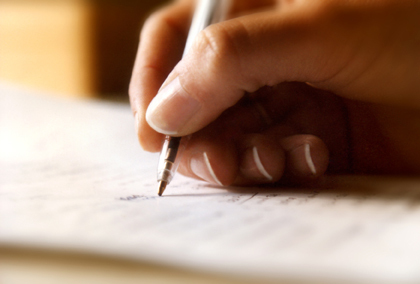 I chalked it up to my first lesson in motherhood–I’m on someone else’s schedule now. He calls the shots! So time to temper my expectations and go with the flow. Easier said than done, especially when my biggest fear was getting to 42 weeks and having to go to a hospital to deliver the baby. When I went in for my 40 week appointment Monica checked me, and she said I was still very posterior. So I spent the week going on lots of walks, got adjusted a couple times, and tried accupuncture. At my 41 week appointment (Tues), Monica swept my membranes, which made me pretty crampy for the next day or so. Through the baby stress test at 41 weeks the baby checked out as healthy and the machine showed that I was having contractions–that was a surprise because I wasn’t feeling them! Encouraging, my body was working away! I also went in for an ultrasound to check on amniotic fluid–all looked good. On Friday of that week I had my next appt with Monica, and she thought maybe baby’s head was a bit tilted, preventing him from engaging my cervix. So she showed me how to do inversions at home to try to lift him up and off, and then go for walks to get him moving down. Along with that I did more acupuncture, took more walks. No contractions. Went in on Sunday (41 weeks and 5 days) and had the catheter put in and went for a walk. To our surprise, it fell out after 2 hours! I thought maybe I had done something wrong, because it came out but labor didn’t start. Amy had me come back in that evening to get checked and get the castor oil+herbs — which I was to take the next morning if I wasn’t in labor. She said my cervix was in a good spot, but didn’t share with me how dilated it was (we found out the next day that I was 4 cm at that point! I’m glad she didn’t tell me — would have messed with my head I’m sure). Cramps started to get intense around 6pm on Sunday, after that appointment. We went for a walk and went grocery shopping. I took a bath at 8pm to ease the cramping, and to get ready to go to bed early to try to get some good rest. I was in bed at 9pm, and contractions started then. From 9pm-1am I was able to rest/sleep between the contractions (8-10 min apart). My back was really feeling it, so I put on a hot pack which really helped. Fran was great at telling me to relax, just as we practiced in class. At 1am I couldn’t lay anymore — contractions were getting more intense, and about 6-8 minutes apart. I tried different positions but all I could handle was standing and leaning against the wall, and then between contractions I found myself pacing the bedroom (with all the adrenaline, I had a hard time relaxing). I had a few unpleasant trips to the bathroom, where I threw up everything in my system. We called the midwife page at 2am, when contractions were about 5-6 min apart. Amy was excited for me that I was going to be able to have this baby without castor oil (I’m pretty sure having that bottle stare me in the face was what started labor) and she listened to me breathe through a contraction. I could still talk through contractions and wasn’t yet vocalizing, so she told me to keep it up and said that next time I call I won’t be able to talk as much. But I gave it a whirl — for 2 contractions on each side. Well that seemed to adjust baby’s position, because I definitely started to feel something new, which I later confirmed was the urge to push! I just went with it, thinking I was still more than 3 minutes apart on contractions (I had mentally prepared for a very long labor)–and I didn’t really wrap my head around the fact that I was already through transition. I guess those juicy hip circles in the runners lunge helped me get through that. But apparently my vocalization changed and based on how I sounded, my doula suggested we make the move to the birth center. This was around 4:30am. Sarah got in touch with Amy, who heard me in the background and said “Oh, yep, I’ll be right there!”. We jumped in the car and the car ride was as promised — hard. Luckily there was no traffic and Fran drove very fast! We beat the birth team to Health Foundations, so I had a contraction or two on the ramp outside the door- -likely waked some neighbors (Sarah found my flip flops in the parking lot, I labored myself right out of my shoes!). Rachel got there first, and we got in the room and had a couple more contractions. I told her I felt my body pushing, so she checked me, and indeed I was 9 cm dilated- with just a lip remaining! 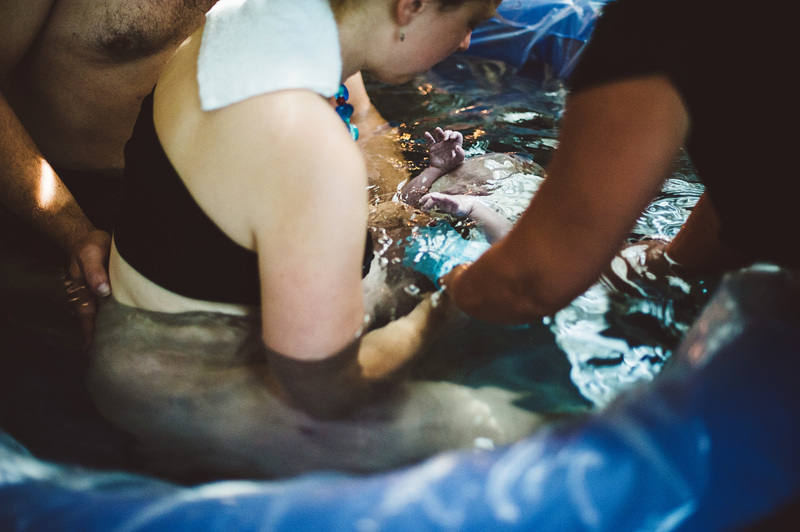 She asked if I wanted a water birth, and I said I was open to it (I wanted to let my labor decide what would feel best when the time came). But I really wanted to labor in the tub for some relief. So she started filling the tub right away–though it felt like an eternity before it was full. While I waited, I labored on the bed on all fours, and put my head down on a pillow to rest in between. Fran got emotional at this point, as he was so relieved that we were at Health Foundations and in good hands–everything got so intense so fast! At one point I looked up between contractions and said “tub time?”… I was thinking, let’s do this! I wanted to get in there and be able to move forward with pushing. The tub was full, I got in, and the pushing urge was really there — Rachel said I could, but slowly like I had been outside the tub. All in all, I pushed for about an hour (the total time I was in labor at the birth center!) — and our baby arrived! I was on my hands and knees, so Rachel said that once he was born she would push him through my legs and he would swim up to me so I could catch him and bring him out of the water. It was completely amazing. He came swimming through with his eyes wide open–such an incredible feeling to be able to grab him and pull him on to me. The birth team was awesome –I was so impressed with all of them. Fran was a champ, definitely benefited from the child birth classes to help prepare. It was tough for him to see me laboring. 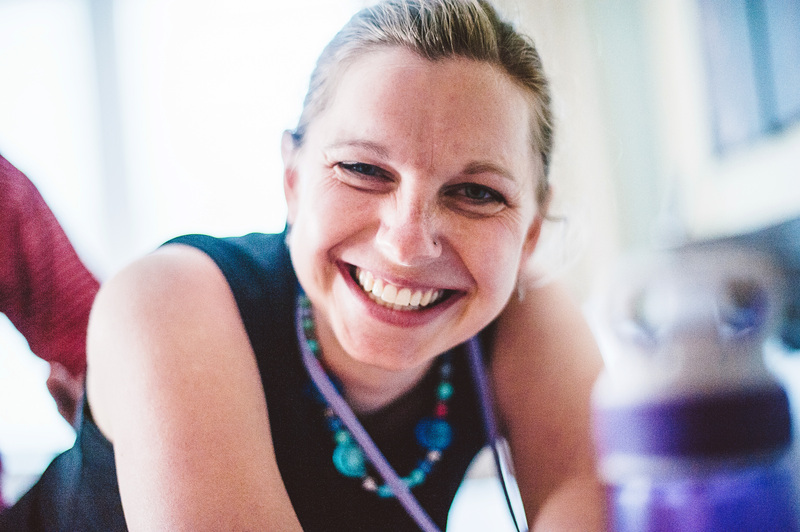 I am SO glad we had a doula–Sarah was amazing, and really helped at home (where the majority of labor ended up happening). 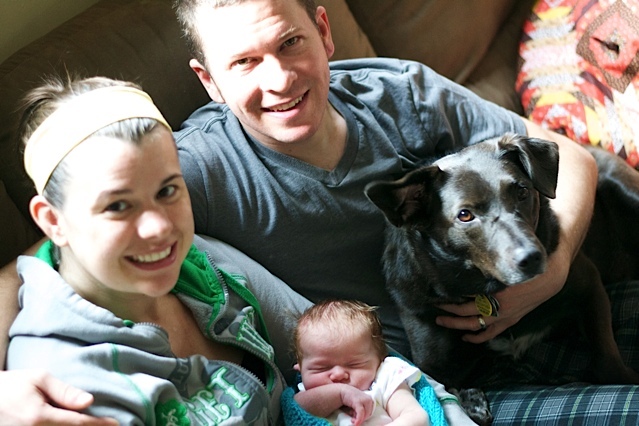 I was surprised that during labor I never questioned my decision to do a natural labor. I was expecting to have doubts and to have to mentally push those thoughts out, but they never came. Also I had been nervous about my umbilical cord being around baby’s neck (I had been told that this is pretty common, but it still freaked me out)–mine ended up being wrapped around his neck once, but it didn’t harm him at all and Rachel was able to easily unwrap it. 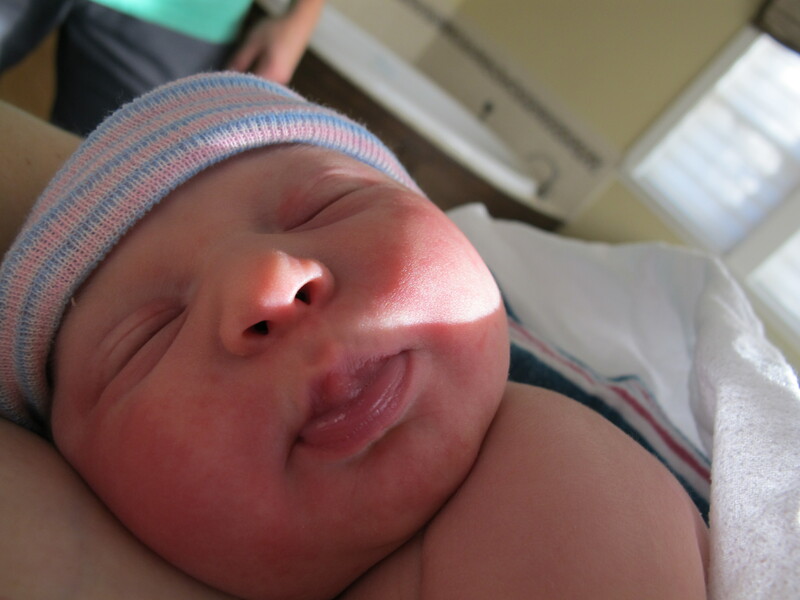 In total I’d say I was in labor for 12 hours (including pre-labor)– 6 of which was active labor+pushing. The birth team applauded my ability to control the pushing, and take it slow. I didn’t need any stitches, and both me and baby checked out as healthy and good to go. I will share that when the nurses had me get up for the first time to use the bathroom (after about 3 hours of laying and bonding with baby), I made it to the bathroom but passed out once I got there — I think at the sight of blood (first time I really saw any… and I have a weak stomach). The nurses took good care of me, got me lots of fluids, and back in bed without any issues. It was truly an amazing experience. Intense. But incredible. 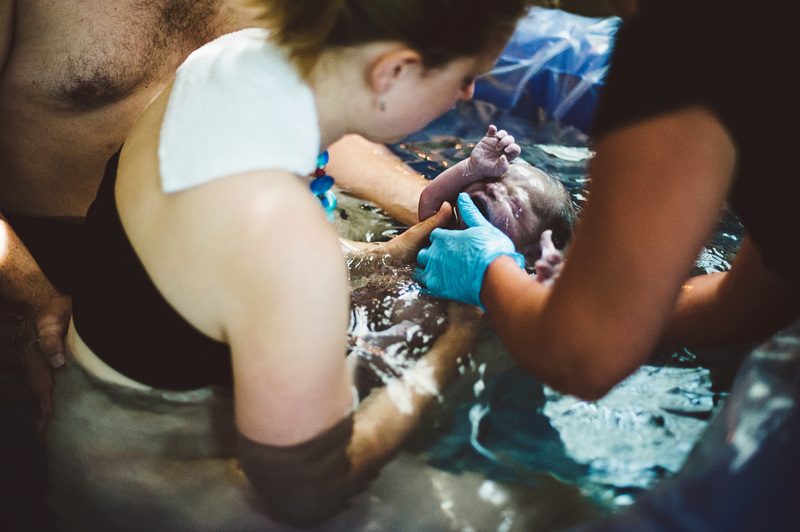 And everyone who has checked on our baby’s health have remarked on how awake, aware, calm, strong, and healthy he is — which was our goal in having a natural birth, and I think only made even better by going with a water birth. And my recovery was smooth and quick, I was excited I didn’t need to have any stitches (even after delivering a 9 lb, 3.5 oz. baby with a 15 cm head — which apparently is in the 99.8th%!). Health Foundations — for providing personal attention and care throughout my pregnancy, and an unforgettable birth experience that helped our family get started in this new life together in a healthy, beautiful, and very special way. My Husband, Fran — for being fully committed to being my partner through this journey, for being such a strong supporter, and a beautiful father. My doula, Sarah Auna — for being a strong, calm, beautiful presence and providing support through this amazing process to both me and Fran. Crossfit St. Paul — for helping me to put health as a top priority, and to learn that my body is stronger and more capable than my head likes to think it is and that I can push through and achieve great things. Body Workers, Amber (chiropractor) and Adrienne (massage) — for helping me to feel amazing throughout my pregnancy, even at 41 weeks pregnant my body felt great! You helped me truly believe that my body was made to do this and it was all very achievable–and perhaps my swift labor was possible because my body was all good to go! Blooma — for being a weekly reminder throughout my pregnancy that my body is completely capable of birthing this baby, and for making the journey towards motherhood a special and sacred time. And for introducing me to my amazing doula, Sarah. 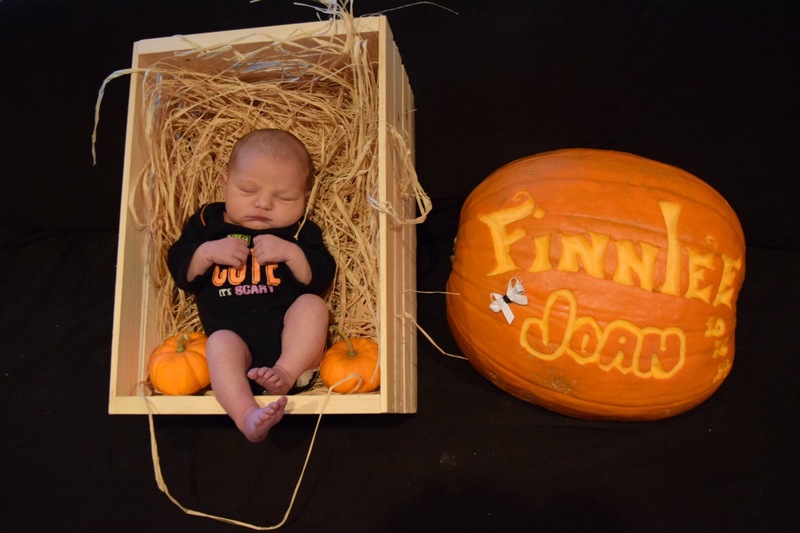 Birth Story: Women should be running the world! T-minus 5 days until the 42- week mark. Monday, Sept. 8 was 42 weeks, this was Wednesday, Sept. 3. We met with Midwife Monica, she had me wear a belly band to make sure everything was lined up. A belly band sounds nice — oh it supports your back from your massive belly. But, actually it was kind of painful and I had to wear it over night. I kept coming up with excuses to take a shower so I could have a reprieve for 10 minutes. T-minus 3 days until the 42-week mark — Friday, Sept. 5. We met with midwife Monica in the morning and she checked things out. She said things had progressed slightly since last time and my cervix was soft. I was dreading the herbal induction but by this point had succumbed to the fact that this is probably in my future. Monica suggested we do the Foley catheter–I would need to return that afternoon so Midwife Amy could insert the Foley. I was sent home with the herbal induction if, by Sunday morning, nothing happened I would need to start the herbal induction — which is ingesting something every 15 minutes followed by a lot of time in the bathroom (as I’ve heard). My husband, Geoff, and I left with my bag of “goodies”. We decided to go to Mickey’s diner in St. Paul to load up on a greasy meal (figured it was similar to an herbal induction, right!?) and then went to Como zoo to walk around. Luckily, I took a 2-hour nap before going back to the birth center to get the Foley. I know we learned about the Foley in childbirth ed class or at the Health Foundations complications class, but until I actually had to have it, I don’t think I filed it in my brain as something to recall. The Foley catheter is a thing that is inserted into your cervix and then two small balloons are filled up with saline solution on each side of the cervix. This is meant to aid dilation. It falls out on its own around 4 cm, otherwise you have to have it taken out. I was scheduled to have it removed on Saturday at 4 p.m.
As soon as midwife Amy filled the balloons, I got instant cramps all over. 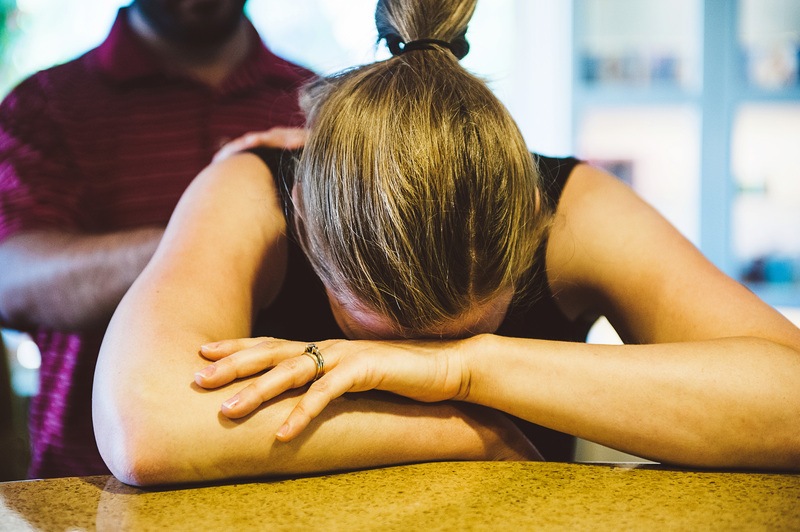 By the time I came home, the pain was so bad, I called the midwife line to see if there was anything I should do — I couldn’t imagine having this constant pain until 4 p.m. the next day. I will remember Monica’s words forever, “Well, Emily, it sounds like it’s doing what we want it to do, which is put you into labor…so wrap your head around that!” I laughed and thought, OMG — no kidding, I can start doing my relaxation and breathing (for some reason that didn’t occur to me until she told me that). Monica said to focus on if contractions were coming and going and to call if they got close together or especially if the catheter fell out. Once I had that to focus on, the contractions were more manageable. I could barely eat anything for supper (rice and cream of mushroom soup) and then I went to bed. The contractions lasted all night but by the morning, they had lightened quite a bit so I could eat a solid breakfast (thank goodness or I don’t know if I would have had the energy). After breakfast we went for a walk which picked things back up quickly — we didn’t make it for a long walk and we had to stop every 5 – 7 minutes to work through a contraction. I got back and called the midwife Amy to check in and let her know where we were at. She said she’d see me at 4pm but to rest and eat some oatmeal. Geoff went and got me some oatmeal of which I could eat half — and then in less then an hour the contractions were so bad, the oatmeal came back up. Geoff called again to let Amy know the contractions were consistently 5 minutes apart ( I was also concerned b/c I needed to get to the birth center for antibiotics b/c I tested positive for group B strep — and they said I should go in about 5 min apart). Amy said to really try to get some sleep and she’d see me still at 4pm. I went to bed to try to get some good shut eye but within 15 minutes I had to pee and out came the catheter — those balloons were WAY bigger than I had thought…Not quite a raquet ball but I’d say maybe two ping pong balls on each side. As it was coming out I thought, what good practice for birth — HA (not the case). This was at 1:45pm on Saturday. We ended up meeting Amy at the birth center at 3:30pm. She wasn’t quite there when we arrived so I had some lovely heaving and ho-ing out on the deck until she arrived. As soon as she opened the door, I went into the birth room (the one on the left), knelt on the ground with my head on the sofa and dealt with a few more contractions while I got my antibiotics. I heard my husband ask Amy, “Do you think we’ll need to go home or is she far enough along to stay?” Amy said based on the noises I was making, I was staying (I was relieved). My doula, Kim, arrived shortly after. I started working through contractions in the shower on a birth ball, which was nice and then Amy had me get up and walk up and down the steps and around the studio upstairs. I don’t know what we would have done without our doula there, it was nice for Geoff to be able to take a break or stay with me when I wanted. I was so out of it, I didn’t notice any lapse in having someone there to help me. And I later found out that he had eaten dinner at some point…who knew!?! Around 6 or 7pm, Dr. Amber (chiropractor) came to adjust me. Her three cute kids walked in and I was again heaving and ho-ing in the waiting room. They were so cute but I couldn’t say a word to Amber! After the adjustment, Dr. Amber had me go to the bed and hang one leg over the bed ( I think we watched a video of this in class) and labor there for a bit. After several of these on each side, Amy checked to see where I was at. With Amy’s check, my water broke because it was right there and she said I was fully dilated and ready to push! I couldn’t believe it! It didn’t even seem possible, I kind of just assumed at that point that the baby would be in me forever and I would have contractions the rest of my life. She said once I stood up, I’d probably feel a lot less pressure and an urge to push. I did feel less pressure but never really had the urge to push — just pushed when I had a contraction as they told me. This was 9:30pm. I started pushing on the birth stool — not really a fan. I felt kind of like the gorilla I saw at the zoo that morning — just sort of sitting there with my big belly while everyone watched me from every angle. Then we did squats in the shower — these were my least favorite as they were the most painful, I think I thought the baby would accidentally fall out on the hard shower floor (I’m an idiot) and I didn’t like that I couldn’t rest in between pushes — just stand. Then we labored on the bed in the normal legs raised position — and a little with the birth ball on the bed..by far my favorite because I liked that I could rest in between. However, Geoff and our Doula sure had to be strong to basically be my make-shift stirrups! We rotated between all of these positions maybe three times. Every time Amy suggested the shower squat thing I gave her a bit of a stink-eye (she later told me!) but complied because I knew the pain meant it was working. Throughout I thought I would not have enough energy to get through it. A few spoons of honey I think pushed me through. Finally, we got to the point where I could feel things happen and Amy told Geoff to get ready to catch the baby. She had one of the nurses (Monica – a nurse in training and her first birth) take his place to hold my leg. That was exciting for me because I knew it was close. I asked if I could push even if there wasn’t a contraction, I was ready for the finish line. I pushed and felt her head come out. Amy told everyone to wait (while she moved the umbilical cord from around the neck). I remember just being super still and then she said, “ok” and I was still. That felt like 10 minutes of waiting for — I didnt realize she was saying ok for me to finish pushing. I just watched her and it felt like silence. Then she looked at me and said, “ok, push” and that was super easy! Elena’s slippery squirmy body went from Geoff’s hands to my stomach — It was awesome! The rest is a blur — I had to get that darn placenta out. I had to cough a bunch which was hard because I was sore everywhere and my throat hurt from groaning for 12 hours. Ok, it wasn’t anywhere as close as hard as birth but I was just tired and wanted to cuddle my baby. Geoff was nervous because there was bleeding and clotting that the nurse was concerned about but they all calmly did what they said would happen in the complications course (super helpful). I was on cloud 9 and didn’t really have any concerns. We packed up and headed home at 5:30 a.m. It felt a little weird to be driving home with an infant after having no sleep at all and going through that but it was nice to be home. All things said and done: Labor for 33-ish hours, active labor for 12-ish hours, pushing for 3 hours, 0 drugs (well accept for the antibiotics and ibuprofen afterwards), 0 herbal inductions :), 1 cutie pie and 1 happy family!! I can’t say enough about how amazed I am with the nurses and midwives at Health Foundations. What an amazing profession they have been called to do. I could never do it but I am so grateful for them! 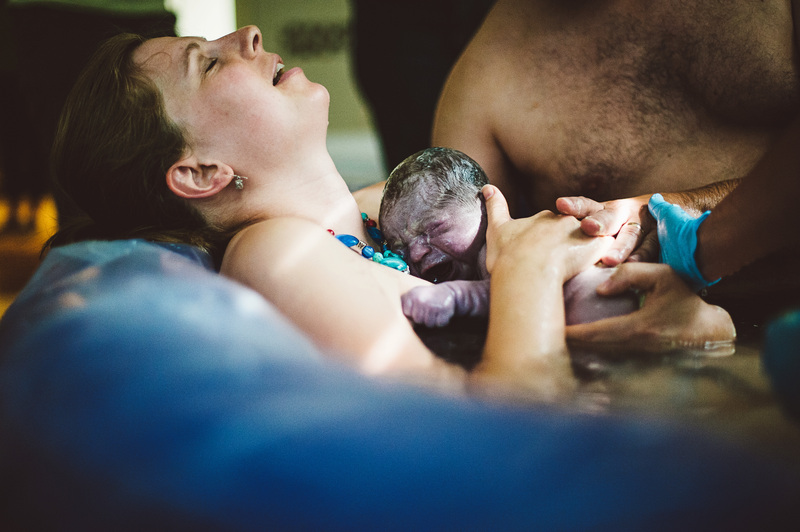 As a birth doula, childbirth educator and mother of 4, I know that birth rarely goes exactly as you hoped or imagined it to be. 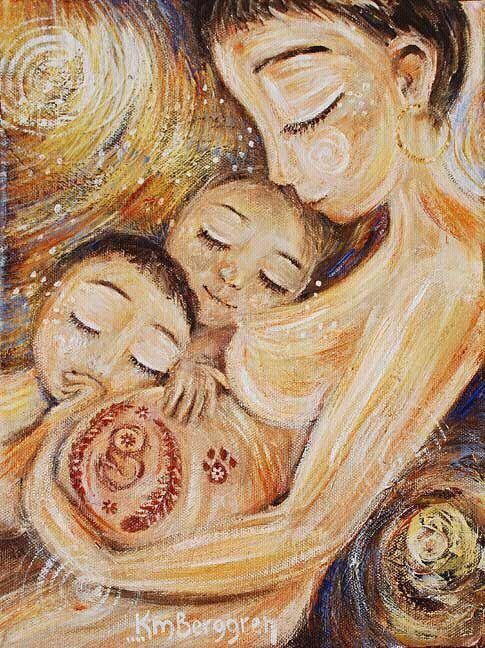 However, in the birth of my fifth baby I experienced what I would call, “my ideal birth”. It was absolutely amazing and I’m so thrilled and thankful for the experience! In the weeks leading up to Jacobs birth, I would have contractions from about 4pm-9pm every 15 minutes or so, nothing too strong, but it was comforting to know my body was getting ready. The day before his birth, these same easy sort of contractions started in the morning and kept going – all day. I wasn’t in labor, but this was different, so I texted my friends who were going to attend the birth that I was experiencing something new – just a heads-up. We had a wonderful evening as a family going on a picnic and swimming at a local beach. Got home and went to bed as normal. That night, at 2:00am, on July 4th, 2014, I woke up with a real, strong contraction. Afterward I went to the bathroom and noticed some bloody show. “Is this for real? A 4th of July baby?” I kept thinking. I went back to bed and had another contraction at 2:30 – again, super strong – definitely different from the weeks leading up to this point. After lying in bed for another 15 minutes, I was feeling restless with lots of adrenaline. I got up and brushed my teeth and did my hair. Yup, I wanted to look pretty for the birth, so I straightened my hair at 2:45am. After that I felt calmer, and went back to bed at 3:00am. I contracted 2-3 more times and at 4:00am told Luis that I was in labor, he promptly encouraged more sleep, so we rested until 5:00am when the contractions were coming every 20 minutes. At 5:30, I called the birth center, Amy told me to eat breakfast and see what would happen as the sun came up. I did as she suggested, eating breakfast with my husband, but had a hard time determining if labor was going to continue or fade. At this point, the contractions were anywhere from 10-20 minutes apart and not getting closer… however they were so, so strong that after each one I would think, “I should be at the Birth Center by now”. At 7:15am I asked if I could come in, we made a plan to meet at the Birth Center by 7:45am. Luis loaded the car, I texted my friends and called our doula. I told everyone that we were heading in, but since I wasn’t sure if this was really going to happen, I told them to wait on standby. The drive to the birth center was fun, Luis and I really enjoyed the morning together – I kept saying, “we should get up before the kids every morning and hang out together”. It was awesome to have a morning, just the two of us, it felt sort-of like a mini date morning together. We arrived at the birth center at 8:00am. Amy was still setting up so we wandered about upstairs… it was nice to have the birth center to ourselves and relax. Initially, in my birth plan I requested no vaginal exams, however I was uncertain if I was really in labor, the contractions at this point were still 10-20 minutes apart. I asked Amy to check me, so I could decide if the team should come on in. She did, and found I was a 7-8cm. I was so relieved and that little bit of knowledge helped me to relax, I was in labor and going to have a baby – today! At this point, I was experiencing a quite a bit of back labor. Amy suggested the TENS unit and I was eager to try it out for myself. It was really helpful – it didn’t take the pain completely away, and I still needed Luis to put pressure on my back, but it felt like a little massage to help ease the pain during and between contractions. At 8:30am, we asked our team to come on in to the birth center. As the birth team started arriving, I welcomed them – we chatted and laughed. Everyone was surprised by the joking and smiling of the morning. I kept saying “we are having a good time” in reference to the birth stories I read in Spiritual Midwifery by Ina May Gaskin. And I really was having a good time, it was so fun to have my friends and family come and be with me on this special day. By 9:00am, Sibyl our doula, Anna my sister-in-law and photographer, Laura my friend and videographer, and Liz, with 2-week-old Maeve, all arrived at the birth center. Having everyone come was a wave of joy. When the last person drove up front of the birth center, I looked out the window and said, “Now that everyone is here we can go have a baby”. I had hoped everyone would be able to come, but with kids and busy lives it was all uncertain – I am amazed that they could all be there. Quickly, the labor picked up – with the frequency of contractions increasing. 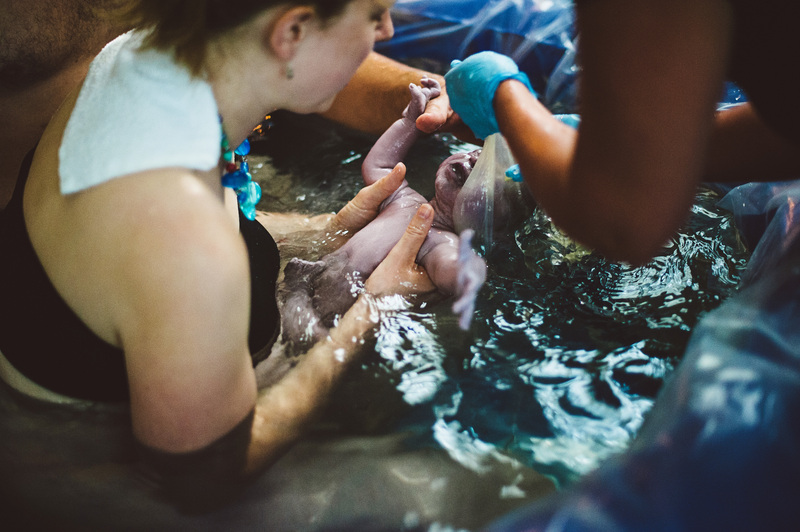 I made my way back to the birthing suite, knowing I’d want to get into the water soon. I looked around the room, it was so beautiful and everything was ready. 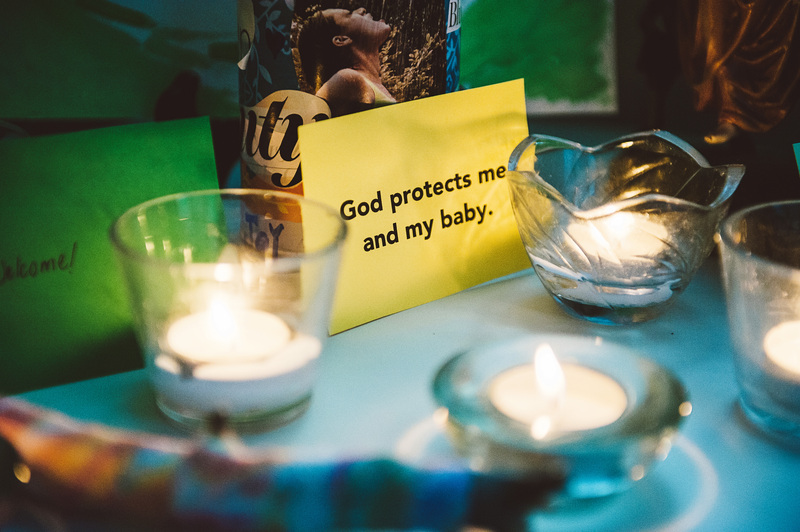 I had set up my birth altar from the Sacred Pregnancy journal & class, I was wearing my birth necklace, Luis was with me every step of the way, rubbing my back and kissing me. Amy, my midwife, whom I truly trust, was ready. 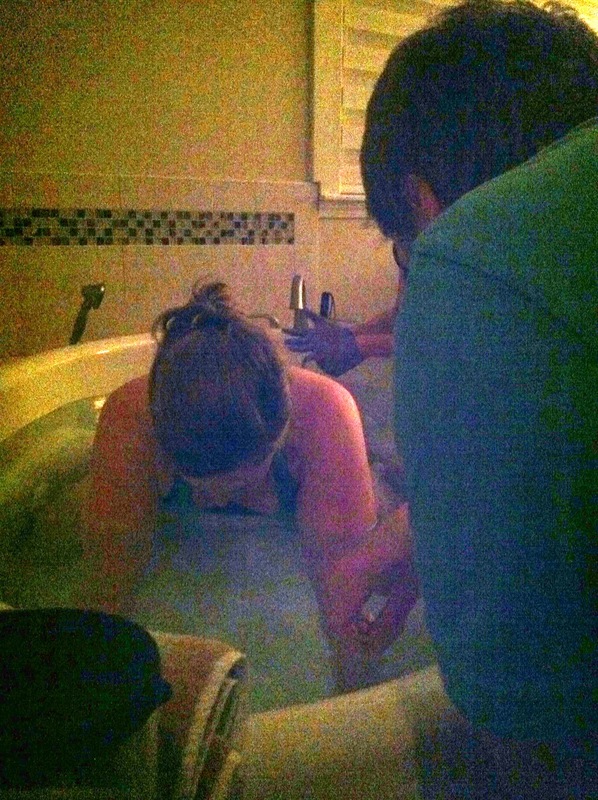 After a few really strong contractions I was ready for the tub. At 9:30am, I climbed into the tub and again looked around the room, everyone was here; it was perfect. I made a joke about everyone watching me enjoy my hot tub and where is my margarita and we all laughed. Did I mention we were having a good time? I rolled on to my knees away from everyone, facing Luis to get ready for baby to come. We quietly talked for a few moments, sharing this little break together. It was a private and intimate moment. Then I had the beginnings of wanting to push. I reached inside to see if baby was close – nope, he was about three inches inside. 10 minutes passed. Next contraction, I felt an overwhelming downward pressure, I couldn’t decide if I should relax or push, so I panicked, I can’t do this. I started shaking my head, I couldn’t breathe and my midwife, husband and doula were all talking to me and encouraging me. “Just Amy,” I said, “Just Amy”. She reminded me to slow my breathing, she told me I was strong, and that I could do this. I repeated her words and calmed down. After a few little pushes, Luis got in the tub and I felt again where baby was at (hoping he was about to crown), nope, still an inch inside. 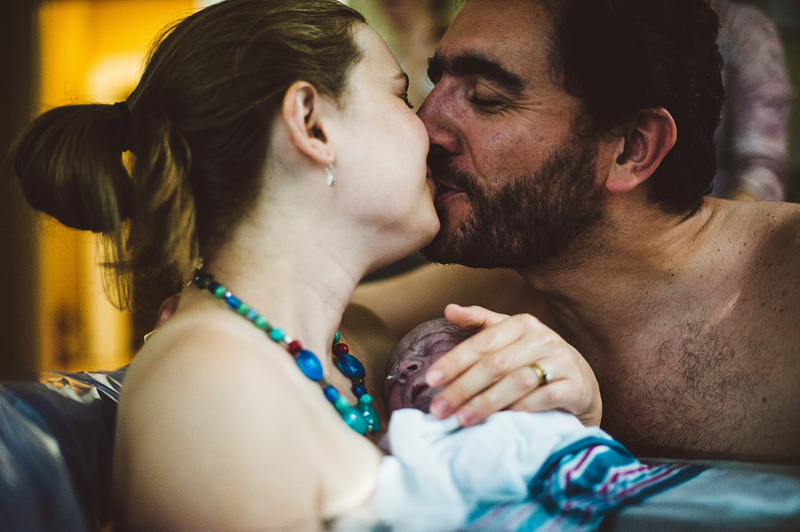 With the next contraction, I felt like a bowling ball was moving through my body, it was so intense, I pushed short easy pushes as Amy encouraged, I reached down and felt the head slowly coming, I stopped pushing wanting everything to stretch, and his head slowly eased out. I said “head”. I could feel the bag of waters around his head, like a soft helmet. Then the bag released and I said “bag broke”. At this point I knew I was going to survive – one more push and I’d be done. With the next contraction, I gave a good strong push and his body slid out of mine. 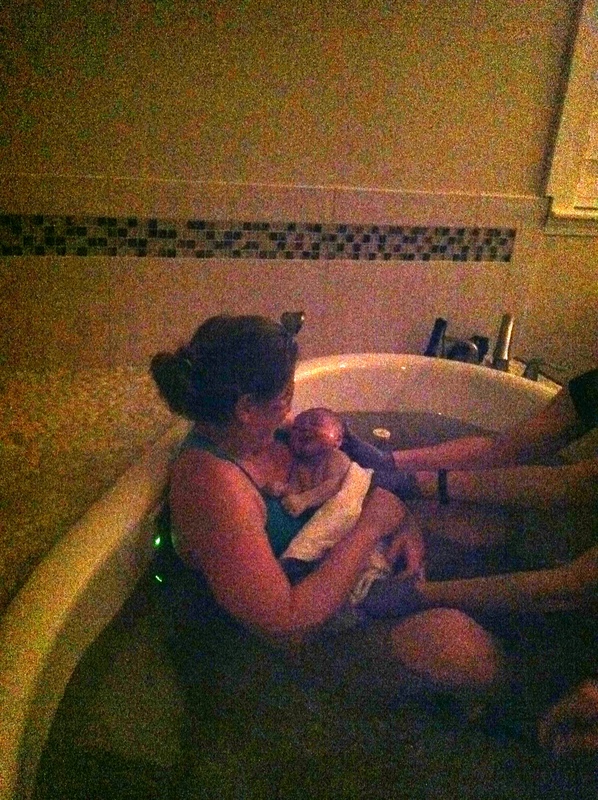 I opened my eyes to see my baby under the water, and slowly brought him up to my chest. The bag was still on his face and Amy pulled it off. As soon as I heard his first little whimper, I breathed a big sigh of relief and laid my head back on the tub. It was 9:51am. After a bit of holding and laughing and rejoicing we climbed out of the tub to the bed. In bed we delivered the placenta and started nursing. While nursing in bed, I discovered a knot in his umbilical cord, which I thought was really cool. We had some food, continued to nurse, and enjoy baby Jacob. Slowly the birth team took off and soon it was just Luis and I and Jacob resting in bed together. Bliss! After four and a half hours at the birth center we were ready to make our way home. 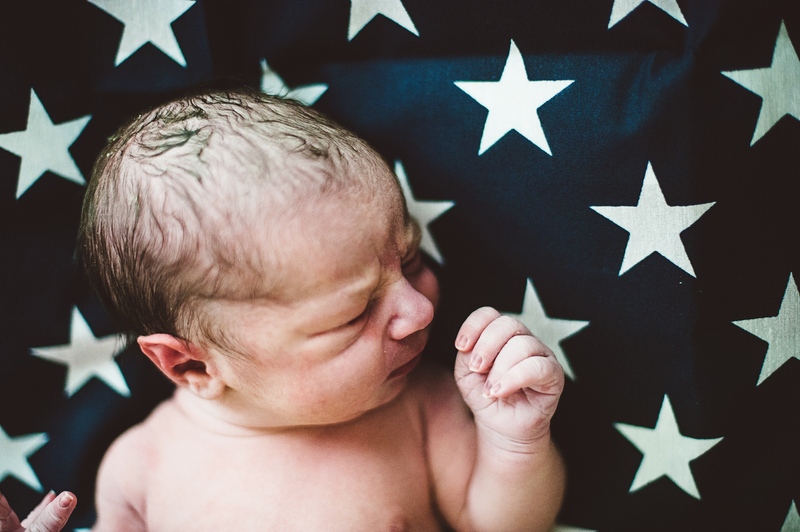 That night, we could hear the 4th of July fireworks as we lay in bed with our fifth baby – we even saw some from our window! It was a celebration of his birth, a beautiful day and new beginning for our family.